My Big April challenge is heading into it's third year. 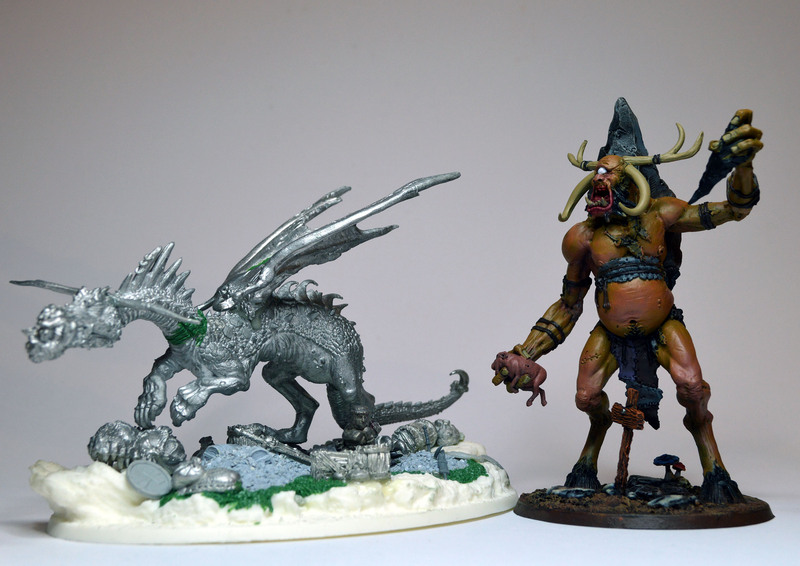 I realize this hasn't exactly caught on as much as I was hoping (paint some giants! post some photos! everybody loves giants! ) but I'm going to keep up the effort as much as I am able! Giants! (And an ogre.) A bit ambitious, and slightly out of focus it seems. 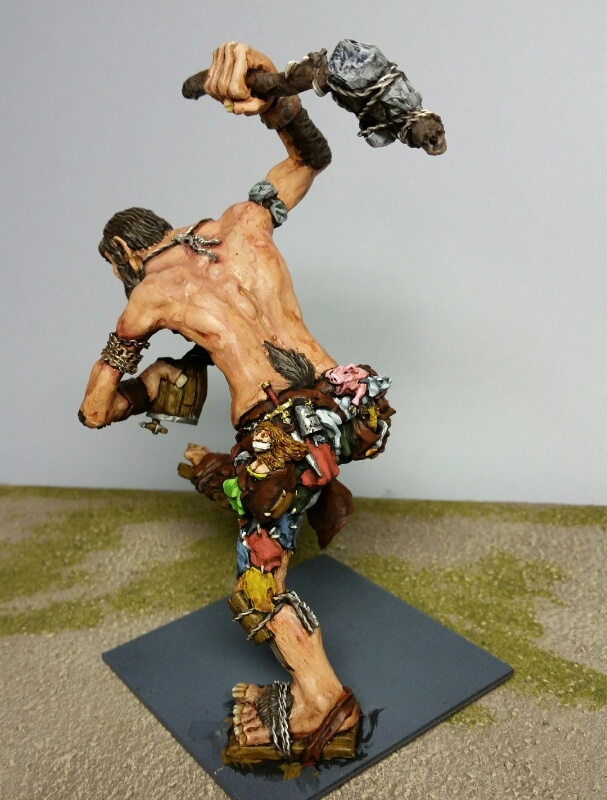 First will be finishing the paint on the Warploque giant. While that's going on, I will prep the other two -- from Heresy and Otherworld. I will try to join in with a giant. 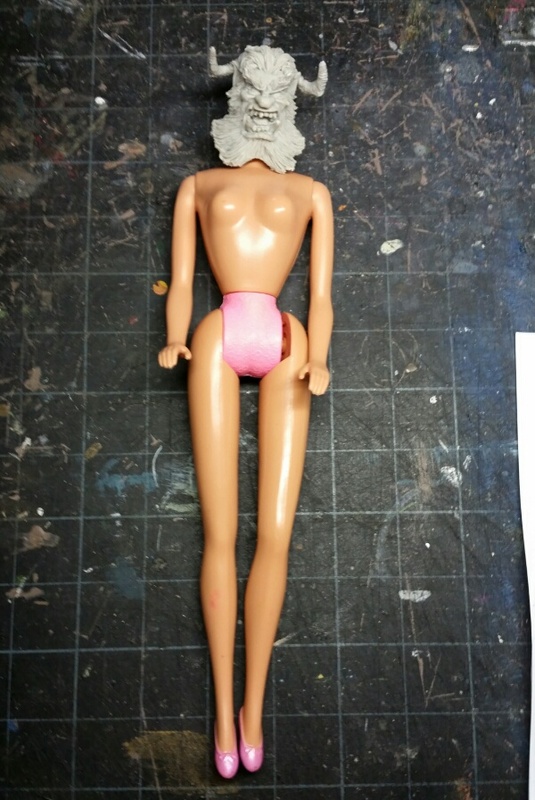 I'll join in if I can get a head for my headless C28 giant. 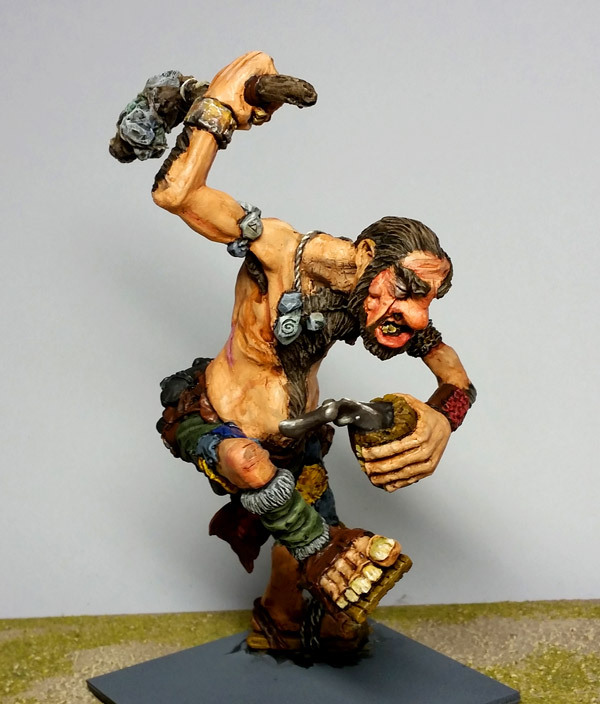 After failing miserably to complete my Grenadier War Giant to first year you ran with this, I now find myself with no 'big' figures to paint , so all will be depending upon my current E-bay bids to settle - if, I have anything to attempt this year - time will tell. Well I for one have been looking forward to April and seeing more giants, even if I don't get much done myself - I seem to be have been too busy to paint much since around this time last year. So that's where I'll pick up. I've slapped some base coats onto my Mierce cyclops, and started experimenting with washes, blending and lots of drybrushing on the base (which is 80mm wide, for scale). He needs at least one more layer of base coat over pretty much his whole body, 'cos the ochre doesn't really cover the black undercoat. I'm tempted to leave the soil quite dark on the base and glue on lots of lighter greenery, but I'm not fully decided yet. I've also started assembling the Great Imperial Dragon - I know he's not a giant, but he's pretty big. 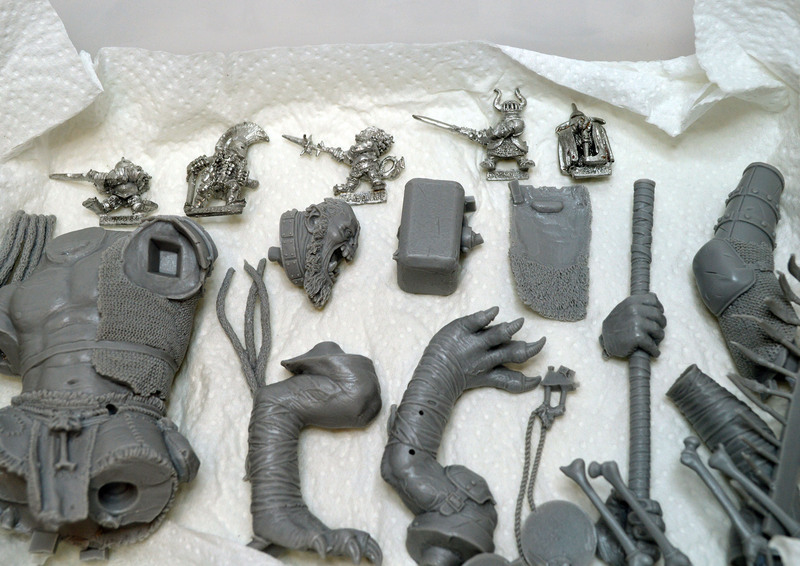 If I somehow finish either of these I'll get started on my Miece Jotun, seen here relaxing after a wash in warm soapy water, alongside some freshly stripped Chaos Dwarfs that I picked up for next to nothing in my local junk-shop on Saturday. 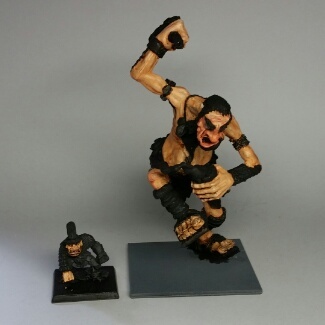 The Jotun's fists are bigger than the dwarfs, although they're almost the worst possible mini to use for scaling a giant. Awesome painting, but a bit more of that giant than I needed to see. Did you finish that one, though? (If so, post it here anyway!) 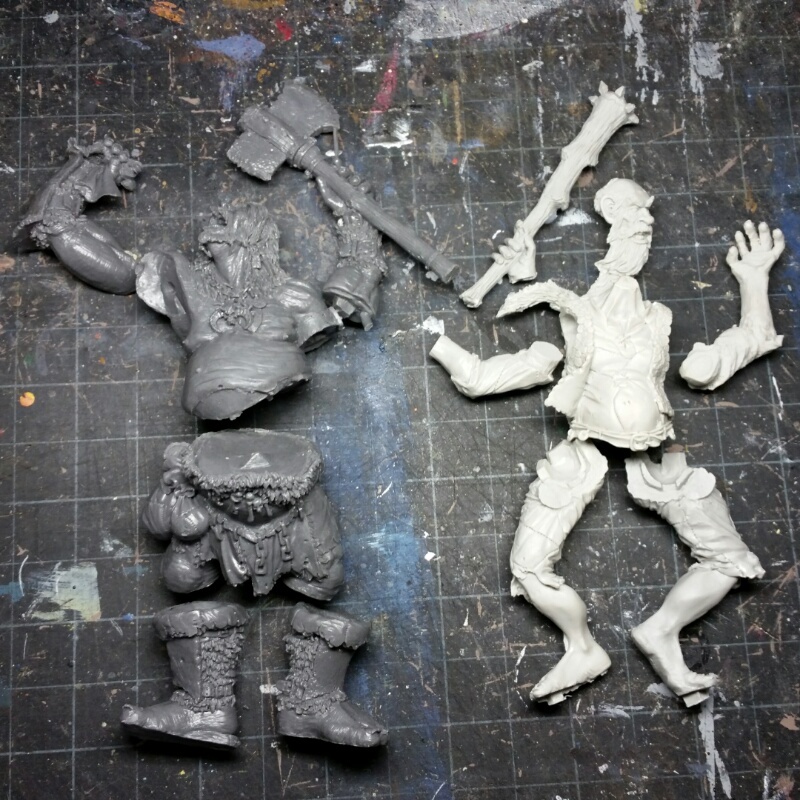 That's one of two Grenadier giants that I'd really like to add to my own collection. OK, my giant has arrived, only it's no giant - following a small amount of brass rubbing and use of a magnifying glass - I found it's a figurine produced by Phoenix model developments ltd, female warrior with snake! I'll still paint it up as it's of a suitable size, but I can't see it getting a run out over a wargames table . She's awesome; you should use her as an Avatar of Rigg! Stormbringer wrote: She's awesome; you should use her as an Avatar of Rigg! I'm certainly considering that option or at least a giantess for my Amazons, I'm more concerned with what type of insignia to paint on her stockings! I agree, would work well with the old amazons. Looking forward to seeing that painted.